This is a new year, and with it comes a new role for me – to train people interested in becoming facilitators of SoulCollage(R) workshops. 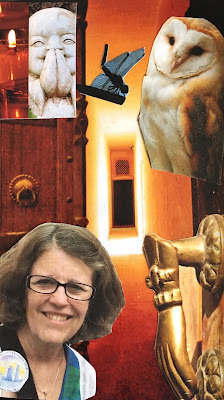 SoulCollage(R) (www.soulcollage.com) is the single most interesting creative process for self-exploration that I have used in over twenty years of leading creative journaling classes and retreats for women. Basically, it can described as an easy, image-based tool to delve into a dialogue with the self in a deep, but playful way. I find it more satisfying than journaling alone (although we do journal and write with the 5 x 8 cards we make). I find it calls on my inner artist without challenging my lack of art skills – anyone can cut and paste images onto cardboard cards. 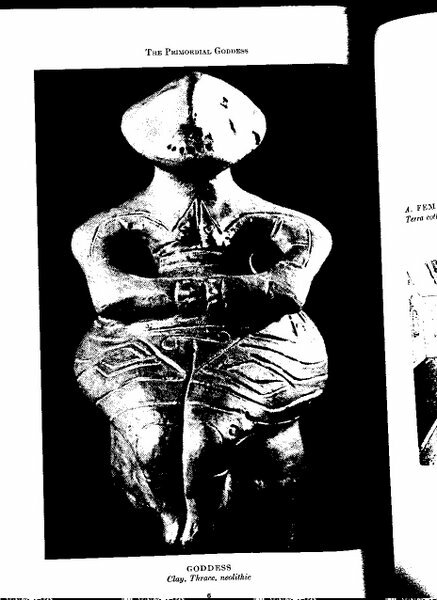 And exploring these images with my imagination, finding out where they come from and what they mean, allows my inner wisdom to pop up as I gain intuitive insights. Sharing this with others in community also provides hours of fun and creative flow. Founder Seena Frost described it this way: "It is a tangible way to know yourself in your diversity and depth, and also to show yourself to others. Showing your deck of SoulCollage® cards to another person can be a profound experience. In like-spirited groups, you can share cards and work with them in many sacred ways. You can consult them intuitively and discover wisdom within yourself which will amaze you. Besides all this, creating them is just plain fun! You will love your deck -- a multi-card Mirror of your Self and your Soul -- whether it consists of three cards or a hundred." SoulCollage(R) has also proven to be a valuable therapeutic tool when used by therapists and professionals as a part of their practice. It has brought healing and guidance to individuals, groups and communities, such as cancer wellness centers, seniors homes, women in prison, conflict resolution, pastoral counseling, couples therapy and many more. Facilitators are sharing and teaching this unique process in many ways with diverse populations and in a wide range of environments. The collage process we use helps to reflect and give a voice to all our parts; sometimes images call to us and we don’t know why, it seems beyond words, until we dialogue with the card and discover who or what it is. 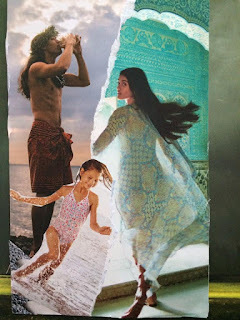 SoulCollage(R) is a great tool for awareness and personal growth, and making the cards is a pleasing process full of synchronicity and surprise. Some of the images you choose will symbolize inner parts of self, maybe your Inner organizer, your happy inner child, or your inner lonely one, or your Inner Nurturer. Others are larger energies, on a mythical level, like the Great Mother, or the hero archetype. These universal stories are woven into our own personal journeys and stories. I see this process as a gathering of the whole, bringing all the pieces together, the unknown or invisible ones, the silent or ignored ones, and acknowledging them, reclaiming them. Tapping into your own inner wisdom using images develops intuition as well. The more you play with it, the more you learn to trust the process. It’s a great life lesson. We can become our own wise oracle, consulting our cards and using our imagination to let the images speak with us. In my own women’s circle, some of us get together every two weeks to make cards, dialogue with them, and then do card readings once a month. Consulting cards you have made to represent energies and archetypes, parts of self and members of your family and friends, is a very rich way of accessing inner wisdom, and to my mind a lot less mysterious or esoteric than consulting a deck of oracle cards devised by someone else with symbols I may or may not understand. There is no wrong or right way to do SoulCollage(R). It is a gentle, intuitive self-care process that reaches deep into our inner pockets of knowing. Most of the people I have introduced to it find it immensely satisfying to both make cards and do readings. 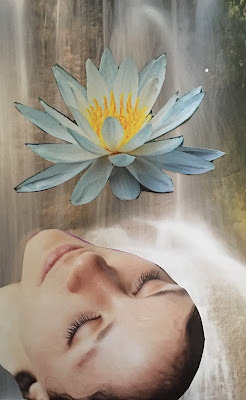 In early July, I will be offering a 4 day SoulCollage(R) facilitator training. All information on registration, lodging and fees is on my website at www.jenniferboire.com. In the training, you will be given a comprehensive, step by step workbook (manual), and all supplies are provided; accommodation and meals are covered in the total fee. You will learn all about SoulCollage(R), how to use it, how to incorporate it in your workshops, including ethical care, and be invited to network with like-minded people. 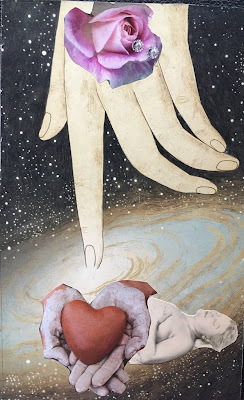 The only pre-requisite is that you have followed an Introductory course on SoulCollage(R), either in person or online, and begun making cards for yourself, so you see the benefit of it, before starting to share it with others as a facilitator. I am one who longs to feel my heart open. I am one who receives guidance from the universe. I am one who feels connected when she is around open-hearted, soulful creative people. I want to bring back more of that Heart Focus in my life this year. Watch this video to hear from some people attending a facilitator training on how and why they love to work with SC. And if you want to learn more about SoulCollage(R) or become a facilitator, just drop me a line. Well, here we are, on the cusp of another New Year. Coming out of a busy holiday time, full of laughter, wine, friends and family, a little bit of too muchness – having enjoyed too much of a good thing, and also in need of rest. At the same time, I am prompted by my inner taskmaster to begin to plan ahead (some of you probably planned ahead already last fall for 2019!). But one thing I have learned over time is that winter is a quiet time for me, energy wise. Yet still I have my lists of projects, unfinished, or not yet begun. I see other facilitators’ offerings for workshops and retreats lined up all the way to fall 2019, and wonder, will I offer something new this year? Or repeat a theme that was popular in 2018, with SoulCollage(R)? By chance I opened a journal of mine from almost ten years ago, November 2009, before I trained to become a SoulCollage facilitator. I was still leading journaling classes. There was a list of things under the theme: What do I love? I am very intrigued, because it appears to me that I have lost sight once again of what I love. I feel a bit worn down, a little fatigued with the need to always come up with new ideas and themes. A guilty part of my soul just wants to do nothing, see no-one, lead no one. In yoga this morning, I felt a deep need to feel my own serene presence. I got flashes during the relaxation part of images of my child self – in Grade 4, as a competitive student, wanting to raise her hand and be seen and heard, at the top of her class. I also saw her flirting with the boys at school. Even younger, I saw her being a good helper to her mom, playing with the siblings and little ones, changing diapers, holding bottles. The need to be good, to be the best at school, the need to be seen and heard is perhaps what lead me to service, satsang and meditation in an ashram for 8 years in my twenties. And then perhaps lead me back to school to study English Literature and Creative Writing and compete as a writer in a world of fiction and poetry. Then after my kids were born, it brought me out of my little part-time writing room into the classroom to lead journaling workshops and then add SoulCollage(R). Now, at age 64, I feel that need winding down. I love talking and being heard. I love meaningful conversations, connections with people. I love being connected to me. I love being and feeling grounded. I love moving with grace. I love eating calmly with awareness, good healthy food. I love having someone else clean and cook for me. I love massages, Reiki and being loved. I love my sisters and brothers. I love my kids, and friends and family. I love reading poems in public. I love singing on stage. I love stepping out of bounds. I love to be stretched. I love music: flute drum bass. I love being quiet and alone, diving deep into yoga, feeling peace. On the next page of my journal was written, What do I want to do right now? “Right now in this moment, I want to allow the wisdom of my heart to bypass the strategist. I want the dreamer to awake and tell me her deepest cherished dream. I want to hold her hand and shush and rock her until she dares speak out loud her deepest wish – she has not shown herself for fear of being judged and she is hiding underneath the bed. She doesn’t like to compete; she hates hype, marketing, meetings and the pressure to create goals. She is anti-goal. She lives for feeling, under the surface of things. She is a shy fish and my outer voice is too loud, it frightens her. I courted her in the past, but gave up, buried her under convention, under Should-Must-Duty. Right now I want to listen. What surprises me about this list is that I did actually write and publish The Tao of Turning Fifty a few years down the road in 2012. I did lead classes from my home until the end of 2017 and workshops till 2018. I did seek out healers, osteopaths, massage therapists and acupuncturists and I did receive healing. In hindsight, it all unfolded exactly according to this desire, expressed silently in my journal, to myself. What surprises me about reading this now, is that I am back in the same place – wondering what I really want to do. I have danced and sung in the spotlight with a quartet, done some musical theatre and sang in an acoustic band with my husband, (check!). I have a women’s circle and a SoulCollage(R) circle where my needs for being seen and heard, and creative expression, are fulfilled. I feel as if I have come full circle - it is time for me to listen in again and receive guidance. I am still anti-goals. That hasn’t changed. I may be competitive by nature, but I have zero desire to get out there and compete in the world of self-care gurus and authors. I think I am winding down that ‘outward’ energy phase of my life. Is that possible? Didn’t I just sign up to be the Inner Wisdom guide? Will I be content to just do yoga, meditate and write in my journal? Of course, the SoulCollage(R) facilitator trainer part is new, and will unfold over the next five months. I am content to hold space for that new learning and to attend a conference of facilitators in Italy in June. But the burning desire to share everything I learn and know has left me. Or at least died down for the moment. I feel afraid it may never return. I wonder who my persona will be without that fearless leader persona leading me. With gratitude, I come back to the list of what I love. I think it’s time to let go of performing and being “good”. And it's time to lose the attitude of provitude, the always striving and pushing myself to be 'better than'. High time to be releasing and letting go of the fear of the future. I welcome my own serene presence, dive into the sacred moment, and the next moment. Trusting it will all unfold for me in 2019, as it did in 2009. Perhaps that little shy fish, la petite fille qui chantait aux fleurs, will surface and whisper in my ear, what she really loves to do.